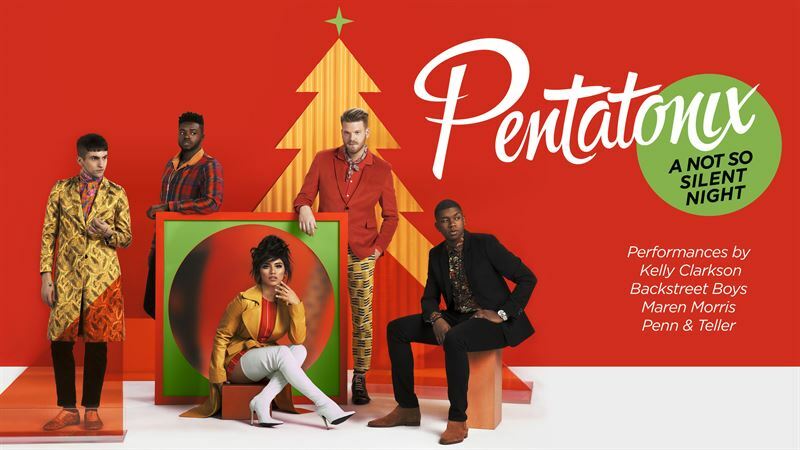 UNIVERSAL CITY, Calif. – Nov. 28, 2018 – Three-time Grammy Award-winning and multi-platinum selling artist Pentatonix returns to NBC this holiday season with “Pentatonix: A Not So Silent Night,” airing Monday, Dec. 10 at 10 p.m. ET/PT. On their third holiday special with the network, Pentatonix embarks on an unforgettable journey throughout Las Vegas, making stops along the legendary Strip including the iconic Caesars Palace and the stunning Eiffel Tower at Paris Las Vegas. Joining Pentatonix are some of the top names in entertainment, including “Voice” coach and one of the biggest-selling artists of all time, Kelly Clarkson; multi-platinum selling resident headliners from Zappos Theater at Planet Hollywood Resort & Casino the Backstreet Boys; Grammy-winning singer/songwriter Maren Morris; master illusionists Penn & Teller performing nightly at Rio All-Suite Hotel & Casino; and more. “Pentatonix: A Not So Silent Night,” is being produced by Ken Ehrlich of AEG Ehrlich Ventures LLC, Pentatonix and RCA Records. Ehrlich is one of event television’s most prolific producers, from the annual Grammy Awards telecast, which he has produced since 1980, to numerous single artist and event specials, including the Global Citizens Festival for MSNBC. He is also currently producing NBC’s “The 50th Anniversary of Elvis Presley’s Comeback Special,” set to air in 2019. Three-time Grammy Award-winning and multi-platinum-selling artist Pentatonix has sold nearly 10 million albums in worldwide consumption and performed for hundreds of thousands of fans at their sold out shows across the globe. Their YouTube channel boasts more than 15.8 million subscribers, yielding over 3.5 billion video views. Their 2015 self-titled album is certified gold after debuting #1 on Billboard’s 200. Additionally, nine of their albums reached the top 10 on Billboard’s 200 chart (two albums reaching #1) and received multiple RIAA certifications for multi-platinum, platinum and gold selling albums and singles. The group recently released their fourth holiday album, “Christmas Is Here,” on RCA Records that includes new Pentatonix arrangements of modern and classic seasonal favorites, with special appearances by Clarkson and Morris. Pentatonix’s three previous holiday albums have all reached #1 on Billboard’s Digital Albums Chart, #1 on Billboard’s Holiday Albums Chart and have charted on the Billboard 200 Chart with two of the albums reaching #1. Additionally, all of the albums have been certified gold, platinum or multi-platinum. Pentatonix is currently on a 17-date “The Christmas Is Here! Tour,” which kicked off Nov. 25 in Grand Prairie, Texas, and continues in Washington, D.C., Boston, Philadelphia and more before wrapping with four shows at New York City’s Beacon Theatre. Tickets for “The Christmas Is Here! Tour” are on sale now at www.PTXOfficial.com. RCA Records is a Division of Sony Music Entertainment. RCA includes a diverse roster of internationally renowned artists representing all genres of music, including Justin Timberlake, P!NK, Childish Gambino, Alicia Keys, Miley Cyrus, Foo Fighters, A$AP Rocky, Kings Of Leon, Britney Spears, Pentatonix, Chris Brown, Christina Aguilera, Backstreet Boys, Dave Matthews Band, ZAYN, Shakira, Enrique Iglesias, Kesha, D’Angelo, Buddy Guy, Daughtry, Three Days Grace, Tool, Kirk Franklin, among others; critically acclaimed and chart topping artists including Khalid, G-Eazy, SZA, Mark Ronson, Miguel, Ray LaMontagne, Bryson Tiller, Cam, Cage The Elephant, Bleachers, Jazmine Sullivan, A$AP Ferg, A$AP Mob, Grizzly Bear, WALK THE MOON, and Elle King; burgeoning artists BROCKHAMPTON, MUNA, Wolf Alice, Kygo, Martin Garrix, Ro James, Becky G., Sam Dew, and many more. RCA Records has key partnerships with Polo Grounds Music, Bazmark Records, Bystorm Entertainment, BPG Music, Keep Cool, District 18 Entertainment and more.